The LG G4 will definitely, 100%, no questions asked, be unveiled on April 28 as an invite expressing exactly that has been sent out. We were already pretty sure the G4 would be landing on the 28 of this month after LG sent out a teasing, "G" laden 'save the date' a few days ago - and we've now got confirmation with the handset getting a name check in the latest update. 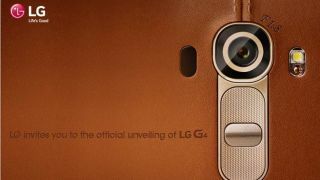 The invite now sports the rear facing camera and button setup you can expect to see on the rear of the LG G4, plus the leather material remains suggesting this flagship won't be clad in metal or glass. A more recent development from LG is a teaser video for the G4 touting a f1.8 camera on the back - hinting at some impressive lowlight credentials - and that spec is again noted on this invite. We'll find out exactly what LG has in store for us with the G4 on April 28, and we'll be reporting live from the event to bring you all the latest. Could this be the phone to take 2014 by storm? Let us know in the comments below.